Rosy Tea has been a winter drink at our house ever since I made it for a New Years Eve party a few years ago. It is a wonderful citrusy slice of warmth on a cold snowy day. Then last summer I discovered it was good cold and over ice cubes as well. So now I keep a carafe in the refrigerator all the time. It’s mine – well, most of the time. The guys are big coffee drinkers but I notice they sneak a glass now and then! First set the tea to steep. 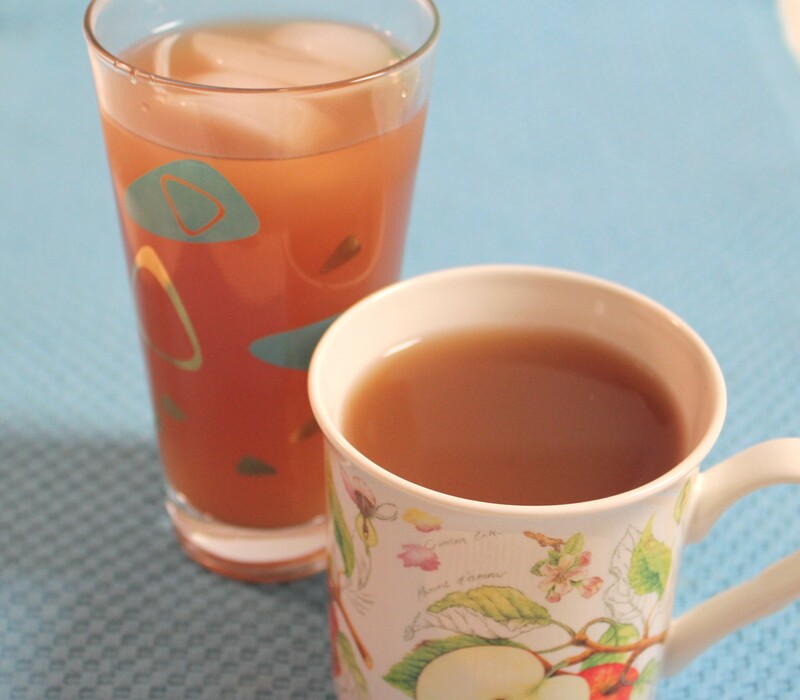 For this recipe, I use the yellow box brand of tea bags because it is being mixed in with the juices, “saving” flavorful and special teas for drinking by themselves. If you are doing this on the stovetop, bring water just barely to a boil, pour into a glass container (I pour it into a glass 2 quart pitcher) and add 4 teabags. OR use the superhot tap OR microwave to heat your water. (You’ve noticed I’m flexible that way?) Let the tea set while you prepare the rest of the drink. I have a four cup measure that I use to heat the juice and sugar mixture in the microwave. Measure, stir and microwave in one container. But you can also do this on the stovetop if you prefer. If you want to spice things up a bit, stir in a teaspoon of cinnamon and/or a quarter teaspoon of nutmeg with the sugar before stirring it into the liquids. The original recipe called for 2/3 cup of sugar. I adjusted it down to a half cup as our tastebuds have changed since we’ve changed our diet to acoommodate Wheel’s diabetes. Many things are now too sweet. Which just goes to show, I think, that many of our tastes are just habit! But you make it however sweet you want! Because it’s too good to quibble over! Mix the two together and enjoy. My pitcher holds the entire amount and then as it dwindles, move it to a carafe that fits the refrigerator. Today, this sumptuous nectar will fill my large travel mug. Wheels and I are leaving for an anniversary getaway – byyyyyyyye! Have a joyful day! P.S. If this isn’t your cup of tea — take a look at this Chai Latte recipe! 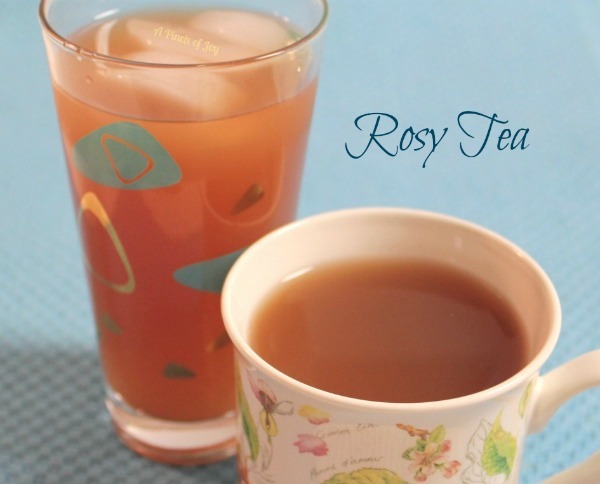 Rosy Tea because it has a generous bit of cranberry juice, a touch of orange juice in a sweetened tea base. Great hot or cold! Bring water to boil, pour into glass or ceramic container and add teabags. Let set about 5 minutes. Mix juices and sugar. Heat to a boil on stove top OR two minutes in microwave. Add juice and sugar mixture to tea. Drink warm. Or alternatively, cool and drink cold. Store left overs in refrigerator in covered container. Sounds fabulous! I love teas too (can’t do coffee) and there isn’t anything better on a cold morning than a fabulous cup of tea! What a refreshing tea mix, we would really enjoy a cup of this tea! Hope you are having a great week end and thank you so much for sharing with Full Plate Thursday. CONGRATULATIONS!!! Your recipe is being featured on Today’s Menu Round Up. Thank you for sharing your recipe with us at Cast Party Wednesday. I agree, this fruity tea is SO good! Happy Anniversary to both of you!